A group of NRIs under the aegis of United Sikh Mission, a US-based NGO, are fighting the odds to establish the Kartarpur Sahib Corridor as a “peace corridor” between India and Pakistan. The corridor proposes to link Dera Baba Nanak in Gurdaspur district in India to Gurdwara Kartarpur Sahib in Pakistan, where the first Sikh Guru is reported to have spent his last days. The Sikhs are seeking construction of the corridor at a cost of US $17 million (about Rs 77 crore), after which Sikh pilgrims from India can have the privilege of entering Pakistan to pay obeisance at the historic shrine and return the same day, without a visa. 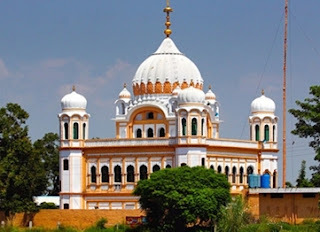 The Kartarpur Sahib gurdwara is located at a distance of 4.5 km from the India-Pakistan border in Dera Baba Nanak in Gurdaspur district, and is visible from an elevated platform from the Dera Baba Nanak shrine located near the border. Rashpal Singh Dhindsa of USA, who is originally from Bias village in Jalandhar district and a member of the steering committee of the Kartarpur Sahib Marg, formed by the United Sikh Mission, lamented that even though the two governments had agreed to building the corridor 11 years ago, the project had been hanging fire due to bureaucratic red-tape. Dhindsa, also the president of United Sikh Mission, along with another steering committee member Gurbachan Singh, recently met Punjab Speaker Nirmal Singh Kahlon, requesting him to press upon the Punjab government to write to the Centre to expedite the corridor project. The Punjab Vidhan Sabha has already passed a resolution in favour of Kartarpur Corridor. Mission office-bearers have earlier met Union Surface Transport Minister Kamal Nath and AICC general secretary Rahul Gandhi, who assured funds for the project. To see the project completed, a number of NRIs have already pledged to collect money and are ready to construct it on their own, provided all necessary permissions are granted by the government. Three shrines of Guru Nanak Dev — a Muslim grave, a Hindu samadhi and a Sikh angitha — exist at this historic shrine in Pakistan. Gurbachan Singh said the Kartarpur Sahib corridor had also received support from the then Union minister for external affairs Pranab Mukherji, who had said funds would be provided for the project. The project envisages a two-lane elevated highway with sidewalks linking Darbar Sahib, Kartarpur, with Dera Baba Nanak. The Sikh shrine is situated along the Ravi river.